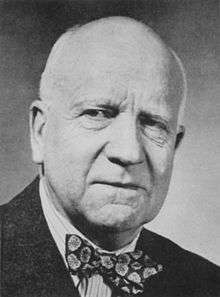 Donald Dexter Van Slyke (March 29, 1883 – May 4, 1971) was a renowned Dutch American biochemist. 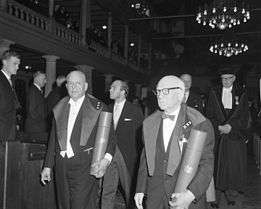 His achievements included the publication of 317 journal articles and 5 books, as well as numerous awards, among them the National Medal of Science and the first AMA Scientific Achievement Award. A non-SI unit of measurement for buffering activity, the slyke, is named after him, as is the Van Slyke determination, a test of amino acids. Van Slyke was born in Pike, New York on March 29, 1883. He completed his BA in 1905 and PhD in 1907 both at the University of Michigan, his father's alma mater. His PhD studies were performed under Moses Gomberg. Van Slyke took up a post-doctoral position at the Rockefeller Institute in 1907, under Phoebus Levene. Levene also arranged for him to spend one year in Berlin under Hermann Emil Fischer in 1911. His early work focused on determining the amino acid composition of proteins. A major achievement during this time was the discovery of the amino acid hydroxylysine. In 1914, Van Slyke was appointed chief chemist of the newly founded Rockefeller Institute Hospital, where he played a key part in developing the field of clinical chemistry. His work focused especially on the measurement of gas and electrolyte levels in tissues, for which he is considered to be one of the founders of modern quantitative blood chemistry. He is also considered by many to have first popularised the term "clinical chemistry" in his two-volume work Quantitative Clinical Chemistry, co-published with John P. Peters. The two-volume work was widely accepted in the medical world as the "Bible" of quantitative clinical chemistry. During this period, he also served as managing editor of the Journal of Biological Chemistry from 1914 to 1925. In 1948, approaching retirement age, Van Slyke took up a position as Deputy Director of Biology and Medicine of the newly formed Brookhaven National Laboratory. He held this position briefly before moving back into research at Brookhaven, which he continued until his death in 1971. 1 2 3 4 5 6 7 8 Hastings, AB. ; Van Slyke, DD. (1976). "Donald Dexter van Slyke.". Biogr Mem Natl Acad Sci. 48: 309–60. PMID 11615659. ↑ Van Slyke, DD. ; Hiller, A. (Jul 1921). "An Unidentified Base among the Hydrolytic Products of Gelatin.". Proc Natl Acad Sci U S A. 7 (7): 185–6. Bibcode:1921PNAS....7..185S. doi:10.1073/pnas.7.7.185. PMC 1084845 . PMID 16586836. 1 2 Bruns, David E. (1998). "The Clinical Chemist". Clinical Chemistry. 44: 1791–1794. ↑ "American Medical Association Award Recipients". American Medical Association. Retrieved February 20, 2011. ↑ "The President's National Medal of Science: Recipient Details Donald D. Van Slyke". U.S. National Science Foundation. Retrieved February 19, 2011. ↑ "Franklin Laureate Database - Elliott Cresson Medal Laureates". Franklin Institute. Retrieved February 19, 2011. ↑ "The Academy Medal for Distinguished Contributions in Biomedical Science". New York Academy of Medicine. Retrieved February 19, 2011.